TV & Broadband €59 offer: New customers joining Sky TV and Broadband. Available in selected fibre areas only. External factors can affect speed (up to 100Mb). Sky Q kit is loaned to you at no cost and must be returned at the end of the relevant subscription. €20-€40 standard set-up for new customers. Price guaranteed for 2 years. Standard pricing applies thereafter (Sky TV from €32 and Sky Fibre Unlimited from €55pm). 12 month minimum term and further terms apply. 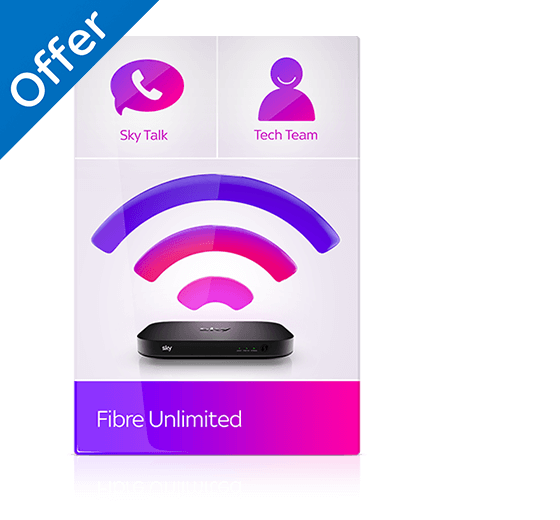 Sky Fibre Ultra: Available in selected areas only. New Sky customers only. External factors can affect speed. Speed varies by product selection. Set up fees from €99 depending on products taken. 12 month minimum & further terms apply. Sky Entertainment €24 a month for 12 months offer: €8 off Sky Entertainment for 12 months for new Sky TV customers, normally €32 per month. Standard price of Sky Entertainment when not signing up to a new minimum term or outside of minimum term: €37pm. Sky Q kit is loaned to you at no cost and must be returned at the end of the relevant subscription. Standard set-up from €25 for new customers. Sky Entertainment €32pm with a new 12 month minimum term. Standard price applies when not signing up to a new minimum term or outside of minimum term: €37 pm. All Sky Q kit is loaned to you at no cost and must be returned at the end of your subscription. Sky TV & Sky Kids offer: New Sky TV customers only. Sky kit is loaned to you at no cost and must be returned at the end of the relevant subscription. Standard pricing applies after 12 months: Sky TV €32 or €37 when not signing up to new minimum term; Sky Kids €8. Sky Kids can be cancelled at any time by giving 31 days’ notice. *€120 saving based on €10 off the standard price of Sky TV in minimum term for 12 months. Standard TV price applies if Sky Kids is cancelled. Set-up fees from €25, minimum & further terms apply. Offer ends 9 May 2019. Sky Kids app: Selected content available to stream and download on demand at no extra cost via 3G/4G/Wi-Fi (data charges may apply). Available on up to 4 registered compatible tablets. Downloaded content deleted from device 48 hours after viewing starts or no later than 30 days after download. Compatible device and software requirements at www.sky.com/help, and the App Store or Google Play Store. App features vary by device. Sky Entertainment €32pm with a new 12 month minimum term. Standard price applies when not signing up to a new minimum term or outside of minimum term: €37pm. Kids add-on available on 31-day rolling contract. Monthly subscriptions to add-on packs renew automatically unless you cancel, giving 31 days' notice. On Demand: requires compatible box connected to broadband min speed: SD: 2 Mbps; HD: 6Mbps. Sky Kids App: Available at no extra cost with the Sky Kids pack. UK, Ireland & the EU where eligible - see sky.com/streamintheEU. Selected content available to stream on demand at no extra cost via 3G/4G/WiFi (charges may apply). 3 month free Spotify Premium offer: Available for new and existing Sky TV customers. Not available to existing Spotify Premium subscribers, Premium for Family subscribers, or if you have previously enrolled in a Spotify Offer. Spotify access through Sky Q box and other devices, Spotify app not available on Sky boxes. New customers: add Spotify Premium after you've completed your Sky Entertainment order. Spotify Premium usually €9.99 a month. Offer entitles you access to the Spotify Premium Service (as defined in the Spotify Terms and Conditions of Use) for a period of 3 months or depending on your eligibility. If you decide that you do not want to pay for the Spotify Premium Service after the Offer Period, you must terminate your Spotify Premium Service by the end of the Offer Period. You may only use this Offer once. Sky Fibre €39 a month: Sky Fibre Unlimited €39 a month. Price guaranteed for 2 years. Standard pricing of €55 pm applies thereafter. Set up costs may apply. New ROI households in selected fibre areas only. Maximum download speeds up to 100Mb. Speeds vary by location. Min & further terms apply. Standard broadband activation fee of €5-€10 depending upon product choice. 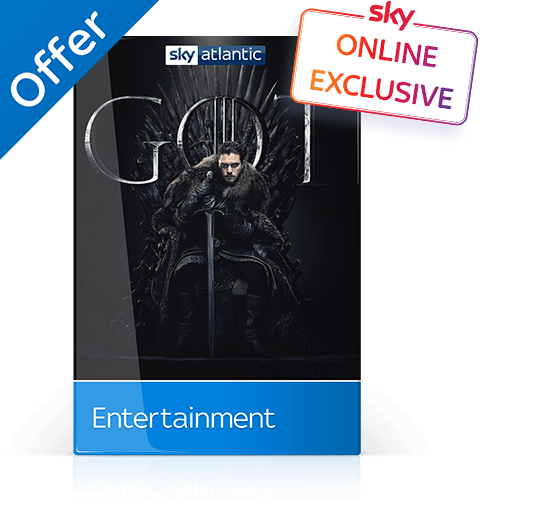 Sky Entertainment €22 a month for 12 months offer: Sky Entertainment €22 a month for 12 months for new Sky TV customers joining on a 12 month minimum subscription. Standard pricing applies after 12 months, Sky TV from €32 - €105 pm. Standard price applies for Sky Entertainment when outside of minimum term: €37pm. Sky Q kit is loaned to you at no cost and must be returned at the end of the relevant subscription. Standard set-up from €25 for new customers. 6 months €20 Sky Cinema offer: New customers joining Sky TV only. Sky Cinema €20 extra pm for 6 months, then standard price (currently €29 extra pm) unless you cancel giving at least 31 days’ notice. Replaces existing Sky TV offers. Allow 24 hours for activation. 6 months €25 Sky Sports offer: New Sky Sports customers only when re-contracting for 12 months on Sky TV. Sky Sports €25 extra pm for 6 months, then standard price (currently €40 extra pm) unless you cancel giving at least 31 days' notice. Replaces existing Sky TV offers. Allow 24 hours for activation. Requires Sky TV from €32 pm. Further terms apply. Sky Broadband Unlimited €39 a month: Sky Broadband Unlimited €39 a month. Price guaranteed for 2 years. Standard pricing of €51 pm applies thereafter. Set up costs may apply. New ROI households in selected fibre areas only. Maximum download speeds up to 24Mb. Speeds vary by location. Min & further terms apply. Standard broadband activation fee of €5-€10 depending upon product choice. Sky TV, Sky Kids & Cinema offer: New Sky TV customers only. Sky kit is loaned to you at no cost and must be returned at the end of the relevant subscription. Standard pricing applies after 12 months: Sky TV €32 or €37 when not signing up to new minimum term; Sky Kids €8; Sky Cinema €29. Set-up fees from €25, minimum & further terms apply. Sky Fibre Ultra: Availability subject to location. Up to 1Gb/s download speed (varies by product selection). Installation and set-up fees apply (varies by installation). Minimum contract and further terms apply. HD channels received depend on your Sky TV/HD subscription. RTE HD Channels, BBC HD Channels and NHK World HD are available without subscription. Sky Entertainment: €32 per month (pm) with a new 12 month minimum term. Standard price applies for Sky Entertainment (€37 pm) when not signing up to a new minimum term or outside of minimum term. Sky TV Subscription: Packages €32 per month. Sky Box Office and Sky Store costs extra. Sky box and set-up required. Sky TV Multiscreen: Provides same Sky TV channels as main Sky TV subscription on another box. To receive Sky HD channels on your Sky Multiscreen box you need a Sky HD box and the HD pack. If you have home broadband, your Internet-enabled Sky boxes must be connected to your router if we’ve provided the equipment you need to connect (E.g. an On Demand connector). Sky Q Multiscreen includes Sky Go Extra at no extra cost. Sky Go terms apply. Remote Record / Series Link: Use sky.com or a compatible device. Requests require up to 30 minutes notice before start of programme. Series Link for compatible Sky HD and Sky Q boxes only. Sky Kids app: Available at no extra cost with the Kids pack. UK, Ireland & the EU where eligible - see sky.com/streamintheEU. Selected content available to stream and download on demand at no extra cost via 3G/4G/WiFi (charges may apply). To download content you also need Sky Go Extra (no extra cost with Sky Multiscreen or Sky Q Multiscreen, otherwise €6 extra a month). Available on registered compatible devices. Downloaded content deleted from device 48 hours after viewing starts or no later than 30 days after download. Compatible device and software requirements at www.sky.com/help,and the App Store or Google Play Store. App features vary by device. On Demand: Available to Sky TV customers with compatible Sky box. Downloading content requires compatible black Sky box, broadband connection (minimum recommended speed 2 Mbps), On Demand self set-up using built in Wi-Fi or own cable. Downloads count towards any usage caps and may expire from your Planner. Content depends on your Sky TV/HD subscription. Sky Store costs extra. Sky Cinema 1&2 or Sky Sports 1&2 required for Sky Cinema or Sky Sports. Downloadable HD content takes longer to start viewing. Ultimate On Demand: Selection of shows/series available varies each month. Downloadable HD content takes longer to start viewing. Ultimate On Demand pack required for Sky Box Sets. Ultimate On Demand and HD packs required to watch box sets in HD. Sky Store: On your Sky box: For Sky TV customers with black Sky or Sky Q box connected to broadband. Buy & Keep unavailable on some older boxes - see sky.com/boxcompatibility. Requires On Demand self set-up using built-in Wi-Fi or own cable or On Demand connector. Downloads take several minutes or longer to start viewing if speed less than 8Mbps (HD) or 3Mbps (SD). Sky subscription needed for ongoing access to downloaded copy. On skystore.com: Requires connected compatible device and software (see skystore.com/help). Register up to 4 devices; a title can be streamed to 1 (rent) or 2 (Buy & Keep) at a time. Min required speed for streaming 3Mbps (SD) or 8Mbps (HD). HD option not available when renting and is not supported for Buy & Keep on some devices/set-ups. Rentals can’t be downloaded. Buy & Keep downloads unavailable on NOW TV, Roku and YouView boxes. General: Downloading and streaming count towards any usage caps. Buy & Keep DVD delivery usually within 5 working days from official DVD release date. Sky Go: UK, Ireland & the EU where eligible - see sky.com/streamintheEU. Streamed via broadband/3G/4G/WiFi (charges may apply). Available on registered compatible devices (content may vary). Some live TV programmes will be unavailable (go to - go.sky.com). For compatible device and software requirements click here. Sky Go is not currently compatible on PCs with Windows 8 or Macs with OS X Mountain Lion. Sky TV Customers: Live TV and on demand content available in line with your Sky TV subscription at no extra cost. You’ll need Sky Cinema 1&2 or Sky Sports 1&2 Packs for on demand Sky Cinema or Sky Sports. Non-Sky TV Customers: Subscriptions from €32 per month. Monthly subscriptions renew automatically until you unsubscribe. Sky Go Extra: Sky TV customers only. No extra cost with Sky Multiscreen, otherwise €6 extra a month. 31 days’ notice to cancel. Concurrent viewing on two devices. Download selected Sky Go content via WiFi (Unavailable on Xbox 360). Content depends on your Sky TV package. Cinema/Sports Pack(s) required to download movies/sports. Max 2 downloads per programme. Content deleted from device 48 hours after viewing starts or no later than 7 or 30 days after download depending on content. 12 month minimum terms. 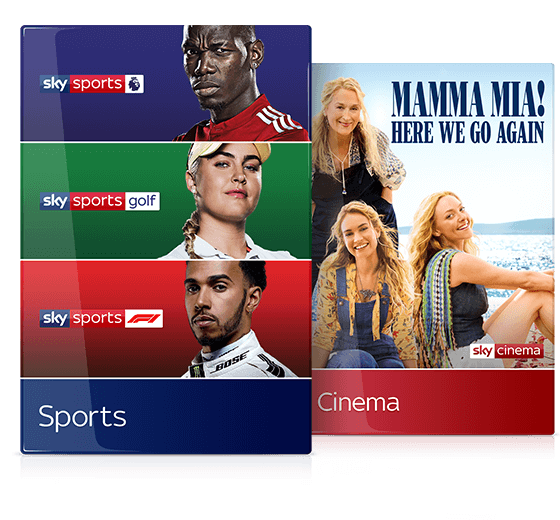 Sky TV subscription: Sky Entertainment (€32 per month (pm)). Sky Q Multiscreen subscription: €17.50pm. Sky Cinema (€29 extra pm). Sky Sports (€40 extra pm). Prices may go up during your contract. All Sky Q kit is loaned to you at no cost and must be returned at the end of your subscription. Sky Q 1TB box: 700GB personal storage. Sky Q 2TB box: 1.7TB personal storage. 300GB storage reserved by Sky. Installation: Engineer set-up required. Standard installation: New Sky TV customers: Sky Q 1TB box: €25 with or without a Sky Q Multiscreen subscription; Sky Q 2TB box: €120 or €60 if you also take a Sky Q Multiscreen subscription. Existing customers when taking a Sky Q Multiscreen subscription: Sky Q 1TB box: up to €25; Sky Q 2TB box: up to €60. Prices discounted to €25 for Sky Q 1TB box or €60 for Sky Q 2TB for existing customers with a current Sky Multiscreen subscription. Existing customers not taking a Sky Q Multiscreen subscription pay €149 for Sky Q 1TB and €179 for Sky Q 2TB. Store more: Compared with standard 500GB Sky HD box. Sky Q Multiscreen subscription required to: 1) Watch TV around the home on tablets or more than one TV. A fee of €120 is payable per additional TV and we’ll lend you one Sky Q Mini per extra TV, at no cost. For new Sky TV customers there is no charge for the first additional TV. For existing Sky TV customers without Sky Multiscreen, the first additional TV fee is discounted to €50. For optimal network performance we recommended connecting no more than four Sky Q Mini boxes. Content from up to two Sky Q Mini boxes can be watched concurrently. In home: watch recordings included in your Sky Q channel pack and most free to air channels. See sky.com/skyqchannelsfor more information. Red Button and BBC on demand content unavailable via Sky Q App; 2) Pause on one screen and continue on another; 3) Take recordings with you to watch offline. Save selected recordings from last 90 days from the main Sky Q box or download on demand programmes to compatible tablet connected to home broadband. Finished recordings may be unavailable to sync for up to a few hours. Two syncs/downloads per programme. Content deleted from device 48 hours after viewing starts or no later than 30 days after sync/download. ; 4) Watch Ultra HD content. Box Sets Bundle required to watch box sets in Ultra HD. Sky Sports and Sky Cinema required to watch sports and movies in Ultra HD. Listed features require Sky Q box, Sky TV and Sky Q Multiscreen subscriptions, Sky Q app and compatible tablet (sky.com/skyqdevices)or Sky Q Mini(s) connected to home broadband. On Demand: Min. recommended broadband speed, SD: 2 Mbps & HD: 6 Mbps. Downloads count toward usage cap. Downloads may expire from planner. Selected channels/programmes on catch up. Selection of series available with Sky Box Sets & varies each month. Sky Store costs extra. 3D requires activation. General: HD TV required. Content depends on your Sky TV subscription and picture quality on device may vary. Sky Q kit loaned to you at no cost and must be returned at end relevant subscription. Connect to TV using HDMI cable (supplied) or AV cable (not supplied). You own the Sky dish. Ultra-HD and 3D require compatible TV. If you live in a flat, installation of our shared dish is subject to survey and your Managing Agent's agreement. Email address required so we can keep in touch about your services. Third party apps: Experience may differ from the same app on other devices. Further terms and charges may apply. Broadband product availability is subject to location. Sky Talk (including line rental) required. Speeds vary with location and line quality. External factors such as internet congestion can affect speed. Sky Fibre: Selected Fibre areas only. Speeds vary by location. Up to 100 Mb download speed. No usage caps. External factors can affect speed. Sky Fibre Ultra: Availability subject to location. Up to 1Gb/s download speed (varies by product selection). Installation and set-up fees from €60 (varies by installation). Minimum contract and further terms apply. 12 month minimum subscription. Set-up costs and router delivery charge may apply. See sky.ie for more details and our Usage Policies. Eircom compatible phone line required. Sky Q Hub: Inclusive for new Sky Broadband customers with Sky Q TV (otherwise €50 if joining without Sky Q TV or €10 if upgrading from Sky TV taking Sky Broadband for the first time). €99 for existing Sky Broadband customers who choose to upgrade or downgrade. Standard broadband activation fee of €5-€10 depending upon product choice. Installation: Engineer set-up required. 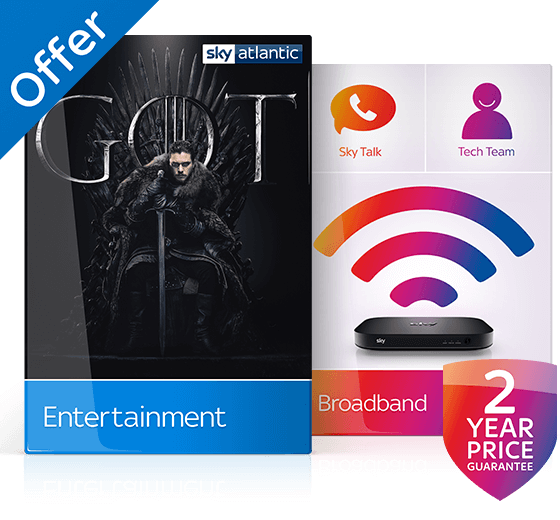 Standard installation: New Sky TV customers: Sky Q 1TB box: €25 with or without a Sky Q Multiscreen subscription; Sky Q 2TB box: €120 or €60 if you also take a Sky Q Multiscreen subscription. Existing customers when taking a Sky Q Multiscreen subscription: Sky Q 1TB box: up to €25; Sky Q 2TB box: up to €60. Prices discounted to €25 for Sky Q 1TB box or €60 for Sky Q 2TB for existing customers without a current Sky multiscreen subscription. Existing customers not taking a Sky Q Multiscreen subscription pay €149 for Sky Q 1TB and €179 for Sky Q 2TB. Subject to status. Upfront payment may be required. 12 month minimum subscriptions. Prices may go up during your subscription. Non-standard set-up may cost extra. Prices may vary if you live in a flat. Sky functionality requires two satellite feeds. You must get any consents required (e.g. landlord's). Prices for Direct Debit payments only. Republic of Ireland residential customers only. These offers are not available with any other offers. Further terms apply. Correct at 27 September 2018. Read the full text of our customer contracts. #Sky Talk Freetime: Inclusive evening and weekend calls of up to an hour to the Republic of Ireland local and national landline numbers only (excludes calls to Directory Enquiries, indirect access, dial-up Internet numbers, mobile, and 0700 numbers) and then calls are charged at rate of 6.90c per minute (evening) and 1.40c per minute (weekend) . Evening – Monday to Friday, after 7pm and before 7am. Weekend - between midnight on Friday and midnight on Sunday. Fair Use Policy applies (see contracts for details). Eircom compatible phone line required. 12 month minimum subscription. Set up costs may apply. Sky Talk Line Rental required. **Sky Talk Anytime: Anytime calls of up to an hour to the Republic of Ireland and Northern Ireland local and national landline numbers only (excludes calls to Directory Enquiries, indirect access, dial-up Internet numbers and 0700 numbers) and then charged at 6.90c per minute (daytime & evening) and 1.40c per minute (weekend). Anytime international geographic landline calls of up to an hour to 20 countries (Austria, Australia, Belgium, Canada, Czech Republic, Denmark, France, Germany, Greece, Hungary, Italy, Luxembourg, Netherlands, New Zealand, Norway, Spain, Sweden, Switzerland, UK and USA (also includes calls to mobiles in Canada and USA). Fair Use Policy applies (see contracts for details). Eircom compatible phone line required. 12 month minimum subscription. Set up costs may apply. Sky Talk Line Rental required.